Ever since Mabby died while picking beans in their garden -- with the pock-a-pock of a helicopter overhead -- four-year-old Valley knows what her job is: hide in the underground den with her brother, Bo, while Da is working, because Those People will kill them like coyotes. But now, with Da unexpectedly gone and no home to return to, a teenage Valley (now Valkyrie) and her big brother must bring their message to the outside world -- a not-so-smart place where little boys wear their names on their backpacks and young men don’t pat down strangers before offering a lift. Blythe Woolston infuses her white-knuckle narrative, set in a day-after-tomorrow Montana, with a dark, trenchant humor and a keen psychological eye. Alternating past-present vignettes in prose as tightly wound as the springs of a clock and as masterfully plotted as a game of chess, she ratchets up the pacing right to the final, explosive end. How often do we want to admit that our heroes or heroines are the bad guys? It's always been a struggle for me to view the main character as the one in the wrong or the one with any faults at all. Blythe Woolston really increases that struggle as she tells Valkyrie White's thrilling story. Black Helicopters chronicles what brings Valley to this present day with revenge on the forefront of her mind and a bomb strapped to her chest. 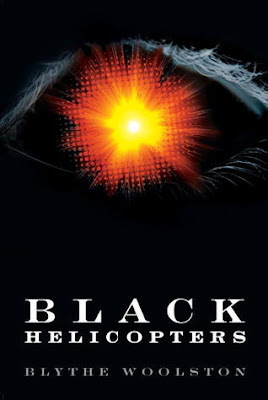 Black Helicopters is considered a literary thriller, mostly because it makes you think about Valley's upbringing and why she makes some of the choices she makes. Her father trained her and her brother, Bo, the ways of life through chess and he taught them how to survive. It's easy to see that their father wasn't a man living an honest life because of all the secrecy and paranoia. Their hiding from the black helicopters actually seemed a very small part of the novel, but it set the foundation for the story's tone: dark and devastating. One thing that I wish this story had was more depth into supporting characters. There weren't many scenes about Valley's brother Bo or Mabby. Sometimes it feels like the story is missing some filling, that information that could provide answers to those many unanswered questions readers will likely have by the end of the book. However, final thoughts about Valkyrie and what happens to her can be inferred from Woolston's writing, which is moving and dramatic. Woolston keeps you on your toes in Black Helicopters. You never know what you'll find out about Valley's life or what might happen next in her story. It's a novel definitely worth reading and afterwards you'll want to explore some of Woolston's other works!